very pleasing effect to the eye. AMERICAN cars and their speedometers are still objects of derision amongst the ill-informed, but anyone who has followed the trend of design on the other side of the Atlantic will have gathered that the latest products of the better American factories really "do their stuff" against the stop-watch. Not being hampered by horse power taxation, their cars are fitted with engines of reasonable size, and the Graham "Blue Streak" under review was dead silent and free from any vibration at a genuine 80 m.p.h. The power unit is an orthodox straight-eight engine with side valves, aluminium Invar Strut pistons, and a five bearing crankshaft with vibration damper at the forward end. An A.C. petrol pump supplies fuel to the single vertical Detroit carburettor, and ignition is of course by coil. The gear-box is mounted in unit with the engine and the whole is supported at four points, the rear ones rubber-insulated. A single plate clutch is used and of the three gears second is of the constant-mesh type, and syncro-mesh mechanism facilitates the meshing of second and top. A cam and roller freewheel clutch is fitted behind the gear-box, and a control on the dash allows it to be locked at will. The transmission layout follows orthodox lines, an open propellor shaft driving a spiral bevel in a three-quarter floating back axle unit. The chassis side-members are of considerable depth, tapering at the front end. The front axle is sharply dropped while the rear one actually passes through the frame, which at this point is about 12 inches deep, the web being cut away to allow for the up-and-down motion of the axle. In this way the chassis line is brought low without needing an excessive "kick-up" at the rear or at the expense of ground-clearance which is inclined to suffer when the chassis passes under the rear axle. The side members are rigidly braced by six cross members. 79 mm. and 102 mm. bore and stroke. Synchro-mesh second and top gears. Ratios 4.3, 7,07 and 12.3 to 1. Free wheel with locking control. Hydraulic four wheel pedal operated. The spring-base is increased by mounting the springs outside the chassis, and the front ones are inclined upwards, with shackles in front and slides at the rear. Hydraulic brakes are fitted, and operate in steel drums, with centrifuse cast iron liners. 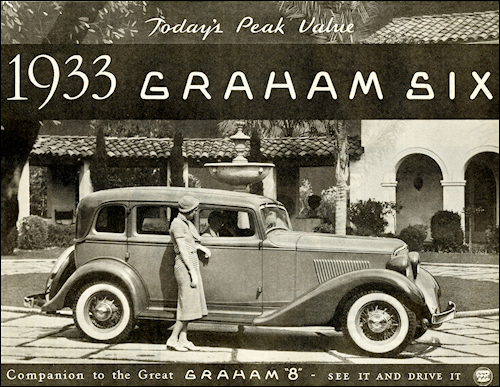 A straight-eight engine, of generous capacity, is expected to produce its power without any effort and the Graham behaved perfectly in this respect. 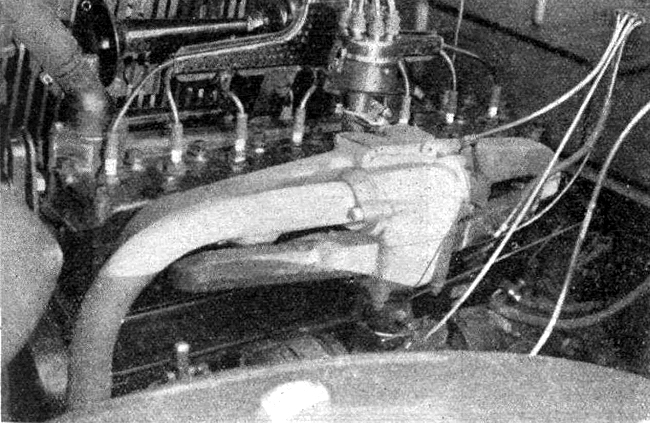 Whether the accelerator was stamped down to the floor boards or gently depressed, there was an instant response, another good point being that the induction system warmed up after two minutes running and the throttle could be used without provoking spitting and the other symptoms of a cold engine often met with on English cars. The throttle pedal was of the piano type, comfortable for long drives. The smoothness of the engine and the faultless carburation allowed one to do everything on top if required, but the gear-box is one which encourages frequent use. The comfortable maximum in bottom is about 25 m.p.h. and in second 45, 50 being attainable in the latter gear with some slight falling-off in acceleration. Second is a silent ratio and first almost so, and a synchro-mesh mechanism on second and top gears allow dead silent changes to be made almost instantaneously without the slightest jar. The gears are so easy and pleasant to change that the fitting of a free wheel clutch seems almost gilding the lily, but it brings about a petrol economy of some 10% and so might be useful on long tours. In operation of course it allows the gears to be changed without the use of the clutch, and when the braking power of the engine is required, as for cross-country runs at high speed, a knob on the dash puts it out of action. the accessibility of the distributor and the spark-plugs. 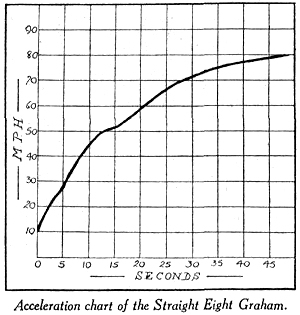 The acceleration figures are very creditable, as the chart shows, and the engine is vibrationless and silent through out its range. The maximum speed, timed over a half-mile, was found to be exactly 80 m.p.h., and at this speed the car was perfectly steady on the far-from-smooth surface of Brooklands track. The engine speeds are approximately 3,550, 3,700 and 4,000 at 25, 45 and 80 on the various gears. The stopping power of the brakes is proportional to the pedal pressure, and with a firm application the car can be stopped from 40 m.p.h. in under 58 feet. This very satisfactory figure might have been further improved if one of the rear brakes had not tended to lock before the others. The Graham excels in fast main-road work and runs happily anywhere between 50 and its maximum. No ordinary hill brings it off top, but for quick overtaking the silent second gear, with its rapid change, is pleasant to use. Hydraulic shock-absorbers are fitted and the damping can be controlled by a knob on the left side of the dash. The car is of course intended to be a touring vehicle in the first place, so that even with the shock-absorbers at their stiffest setting, a certain amount of roll was experienced when cornering fast. This could be overcome by fitting a set of friction dampers to supplement the hydraulic ones, any harshness at low speeds being checked by operating the ride-control. Even with the suspension as it is, the rolling does not prevent corners being taken at good speeds and with a little extra pressure in the rear tyres, the back passengers are not conscious of any difficulty. The steering is rather low-geared, but is light and free from play. It handles well at high speed and a small amount of caster assists in straightening out after a corner. The saloon body fitted to the car we tested had unusual and individual lines. 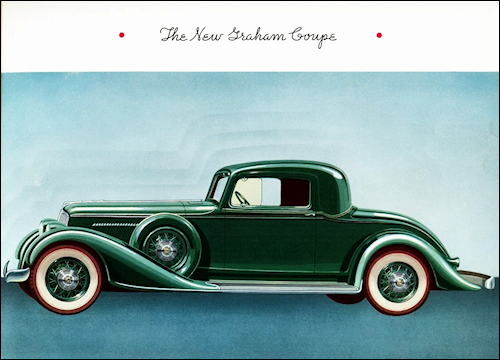 Like many other cars in Europe and America the Graham is fitted with a sloping radiator stoneguard, and this slope is matched by that of the windscreen, doubtless with advantage in wind-resistance. The front wings extend well over the wheels and have a fairing at the back which improves their mud protection, and the same thing is found to a lesser degree in the rear ones. A spare wheel with a neat metal cover is fitted into each front mudguard and a strong luggage grid is carried at the rear of the body. 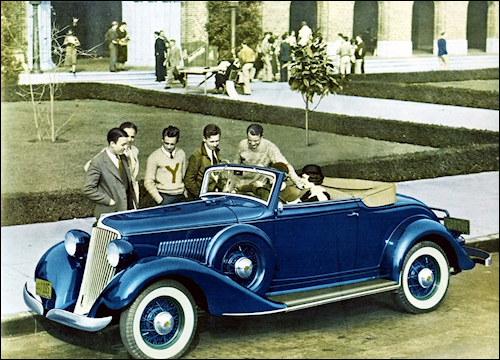 The car was painted an attractive shade of blue and the finish was excellent. The only accessories to which we took exception are the lamps. They give a fiat beam which is non-dazzling and which allows a speed of 50 m.p.h. or so on straight roads, but for picking out cyclists on the winding highways of the less populated parts of the country more powerful lamps are required. The dipping beam, which is brought into action by a control on the steering column, was excellent in fog. The interior of the body is well finished, the front seat is comfortable and can be moved backwards or forwards. The back seat had ample room for three passengers. The controls come well to hand and the dashboard instruments, speedometer, petrol gauge and oil pressure gauge, ammeter and radiator thermometer are easily read. The fuses are under the scuttle and a special bulb lights that part of the car. 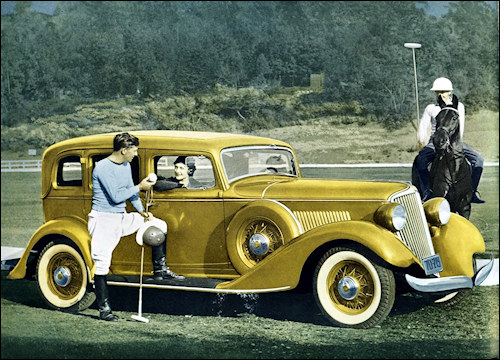 The Graham, then, is a smooth and silent touring car in which nothing has been sacrificed for speed, but which is faster than a number of sports cars. For anyone who wants to cover long distances in complete comfort and at high, speed, the car would seem ideal, while the ease of handling commends it to those with less ambitious needs. The chassis length of the car we tested is 10ft. 3in., and the car complete weighed 33 cwt., but there is also another available 4 inches shorter. 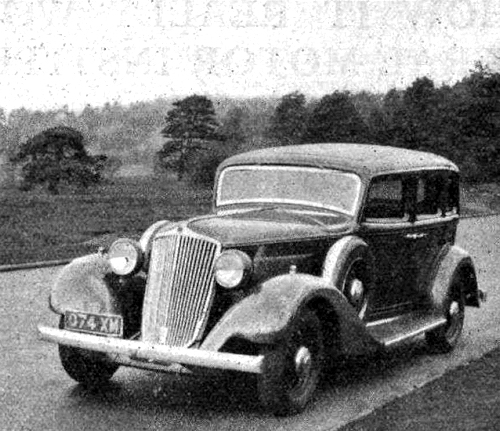 With a light four-seater body and a high-compression head, which is already available, the big engine should be capable of pulling a 3.8 to one axle ratio giving a road-speed of 90 m.p.h., and we understand that the concessionaires of the Graham, Cleverlys Ltd. 175, Cleveland Street, W.1., who placed the test car at our disposal, have designs for a car on these lines.